Luke Fowler, digital reprint of photograph by Alec Hill; (Dave Jackman playing drums at side of river. North East tour, 1971). 2006, C Type print. In his latest documentary film, ‘Pilgrimage From Scattered Points’, Luke Fowler outlines the history of the Scratch Orchestra, composer Cornelius Cardew’s free-thinking grouping of musicians, non-musicians and other interested parties. 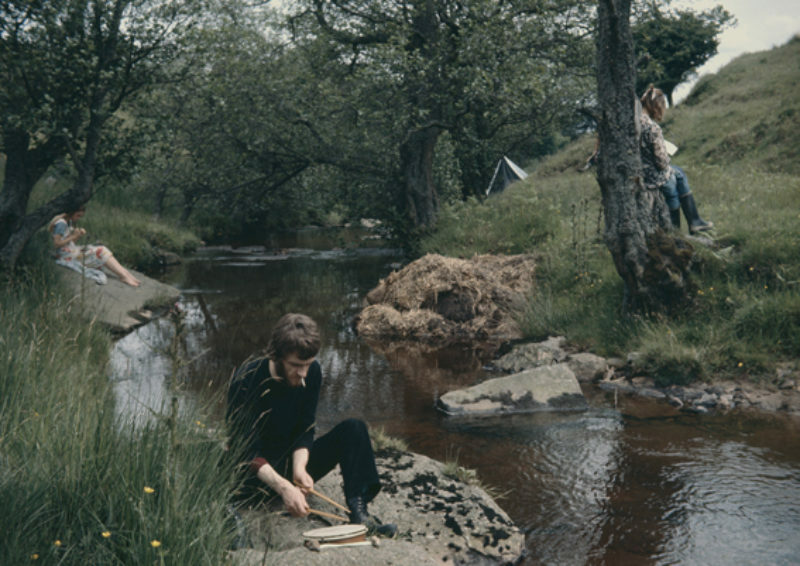 Using archive footage—much of it culled from Hanne Boenisch’s 1971 television film Journey to the North Pole —alongside interviews, shots of ephemera and Super 8 vignettes (some featuring Fowler himself), ‘Pilgrimage From Scattered Points’ is at once a coherent narrative essay on the orchestra’s history, and a fluid portrait in film of Cardew and his confreres. Divided into seven sections, it runs from the group’s formation in 1969 to its rancorous split in the mid-1970s, by which time tensions between two factions, fostered by divisive debates on the function of art—a Maoist tendency who argued for making music to serve the people and a ‘bourgeoisie idealist’ camp devoted to formal experiment—had risen to boiling point. Along the way, we learn that the Scratch Orchestra—defined in their ‘Draft Manifesto’ as ‘a large number of enthusiasts pooling their resources (not primarily material resources) and assembling for action (music-making, performances, edification)’—improvised from visual scores, including a dog-eared copy of the Radio Times . And their approach to public performance was no less unconventional. Seeking to engage audiences unused to experimental music, the group toured village halls, shopping centres and train stations, sometimes arousing the ire of the authorities, often playing to bemused audiences. This clear narrative, although undermined by free-wheeling editing and confused by narration from members of the orchestra or other commentators, sets ‘Pilgrimage’ apart from Fowler’s past work. His previous films—‘What You See Is Where You’re At’, on maverick Scottish psychologist RD Laing; and ‘The Way Out’, a biography of Xentos Jones, lead singer of avant-punk group the Homosexuals—were both hewn from archive footage and recordings. But both were loose in comparison with ‘Pilgrimage’; closer to bewildering, near-psychedelic portraits of the subjects than documentaries from which ordered information could be gleaned. At least one reviewer took Jones to be a fictional character or mythic stand-in for every underground obscurity with a cult following. In contrast, Fowler’s latest is a working primer on its subject. And yet, this latest film can be seen as key to Fowler’s practice to date. While a little closer to documentary in the conventional sense, it covers similar ground to the earlier works. There is, once again, an emphasis on the eccentric (a tag that fits Laing, Jones and the key players in the Scratch Orchestra, but does none of them justice), on utopian idealism, on collaboration, and on improvisation. These last three tenets could almost serve as Fowler’s own manifesto. Shaddaz, Fowler’s record label, fanzine and DVD imprint, was set up to foster collaboration between visual artists and musicians. In his group Rude Pravo, named after the official newspaper of the Czech communist party, Fowler improvises with tape loops and unorthodox instrumentation, an aspect of his musical practice he takes further when performing with fellow improviser John Fail. The show accompanying the debut screenings of ‘Pilgrimage’ is, too, an odd mixture of curating, appropriation and collaboration. In it, photographs of the Scratch Orchestra taken by Alec Hill have been digitally reprinted by Fowler, the two sharing credit, and a silkscreen print of Keith Rowe’s ‘Village Concert’ poster is on show, matched by the only ‘original’ Fowler, another poster, this time collaging together scores, texts and newspaper clippings relating to the Orchestra. 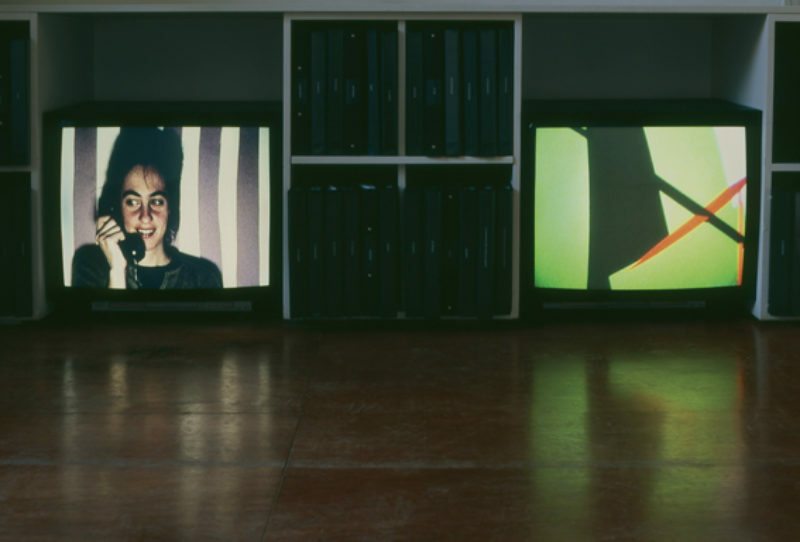 Two specially commissioned animations, one by Alasdair Willis, another by Rude Pravo member Lucile Desamory, are displayed on monitors in the gallery, and despite—or because of—being tangential to the subject matter, are folded into Fowler’s film, emphasising the idea that filmmaking is, inevitably, a collaborative process. ‘Pilgrimage From Scattered Points’ can, then, be seen not just as a continuation of Fowler’s practice, its subject matter following his established interests, but a reflection of—perhaps even an investigation into—that practice. Fowler’s anti-auteurship is twinned with a more successful expression of Cardew’s experiment in orchestrated democracy, and the non-musician members of the Scratch Orchestra match Fowler’s status as an artist combining roles—filmmaker, musician, publisher, enabler and collaborator—more often found outside the gallery than in.